This 4 day Rwanda gorilla safari offers you an opportunity to track the gorillas twice , (two gorilla families). The safari also offers you an opportunity experience Rwanda culture, golden monkey trekking as well as hiking the Dian Fossey tombs. Upon arrival at Kigali Airport you will be picked up by a guide from our Rwanda tour operator company. This guide will drive you to Volcanoes National Park in Musanze. You will check-in to the lodge for dinner and overnight stay as you get set for your mountain gorilla trekking adventure the following day.. This is the day you experience your first Rwanda gorilla trekking encounter. After having a very early breakfast you will head for the volcanoes national park headquarters for a routine gorilla tracking briefing where you will be informed about the Do’s and Don’ts while on your gorilla tour. You will thereafter be allocated a gorilla group to track which is done randomly. 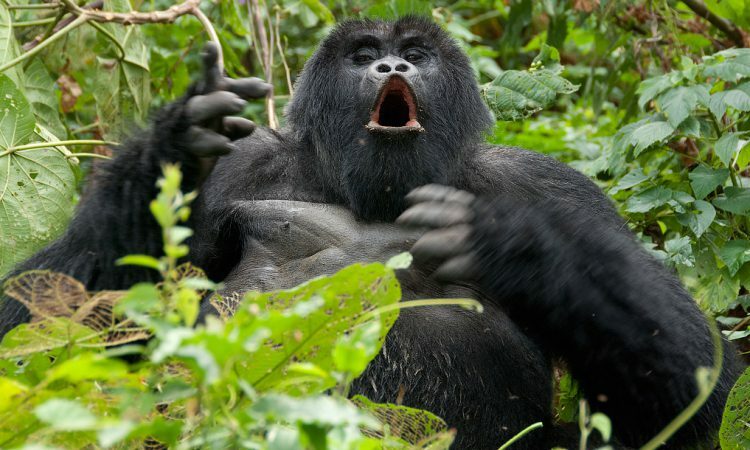 You will then proceed in to the jungles of Virunga covered in thick rain forest to start your gorilla trek. The gorilla tracking exercise lasts for between 2 to 8 hours after which you will proceed back to the lodge for relaxation and lunch. Later in the evening there is an optional nature walk in which you can visit Ruhondo and Burera before going back to the lodge for dinner and overnight stay. On the 3rd day of your Rwanda tour, you will still have an early morning breakfast after which you will proceed back to the Volcanoes park headquarters to enjoy your second gorilla trekking activity. After tracking the gorillas, you will return for lunch at the lodge and relax before going for a cultural walk among the Rwandans (Banywarwanda community). Early in the morning you will go for golden monkey tracking in the thick jungles, before proceeding to see the Karisoke Research Center and hike the tombs of Dian Fossey an American scientist who did her research on gorillas in Rwanda. Later in the day you will drive back to Kigali for your scheduled flight back home.